DAREDEVIL: BORN AGAIN, by Frank Miller and David Mazzucchelli is considered by many to be one of the best comic arcs ever. The 7-part story that ran in DAREDEVIL Vol. 1 #227-233 has been collected in hardcover and softcover editions many times, but this year, something unique has been produced by IDW Publishing. 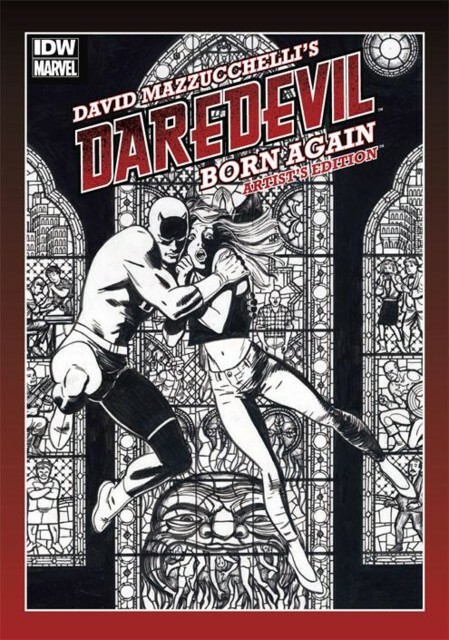 DAVID MAZZUCCHELLI'S DAREDEVIL BORN AGAIN: ARTIST'S EDITION has been released this week, and for comics fans, it's a collection worth looking for. AN ARTIST'S EDITION PRESENTS COMPLETE STORIES WITH EACH PAGE SCANNED FROM THE ACTUAL ORIGINAL ART. While appearing to be in black and white, each page was scanned in color to mimic as closely as possible the experience of viewing the actual original art.for instance, corrections, blue pencils, paste-overs, all the little nuances that make original art unique. Each page is printed the same size as drawn, and the paper selected is as close as possible to the original art board. Mazzucchelli personally scanned each page for this collection and oversaw many aspects of the production. I contacted editor Scott Dunbier to ask him some quick questions about what's involved with producing these types of editions and he gave a few more details about working with Mazzucchelli. 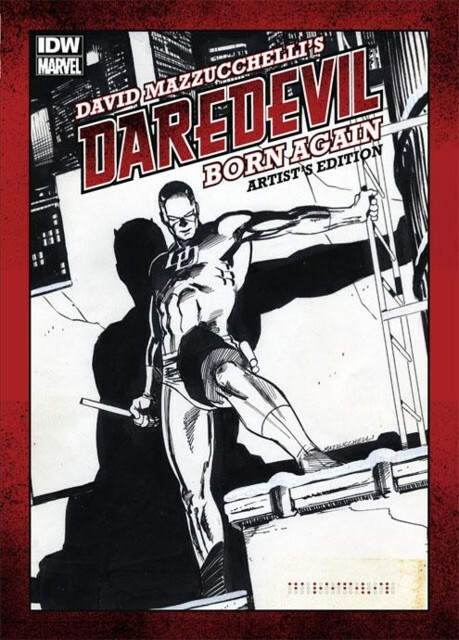 Kuljit Mithra: Thanks for answering some of my questions about the Daredevil Artist's Edition. With it coming out this week, I'm sure you must be excited to see what fans think of it. Having only seen pictures of your previous editions, I can only imagine the work involved in producing this one, since it's the largest at 200 pages. How do you determine what would be a perfect fit for these editions and what led to Born Again? Was it simply knowing David Mazzucchelli had most of the original artwork? Scott Dunbier: David having the art certainly made it a lot easier, as did Walter Simonson with Thor. But the most important thing is the quality of the work -- Daredevil Born Again is by two incredibly talented creators at the peak of their artistic games. Not really a tough call to make. Mithra: Can you briefly go over how the scanning was done? I see from the solicits that it's 12" x 17" and scanned in color, and Mazzucchelli was involved with the scanning. Is there any kind of retouching or resizing? And what kind of paper is this printed on? Is it similar to the art boards? Thanks to Clayton for his pics! Dunbier: With a book like this the key is to be true to the original art. Scanning is done same size as the original art, and we scan the full art board, not just the art -- that's because the paper is sometimes nearly as interesting as the art itself. As for retouching, there is always some degree of color adjustments that are made, but in this case David did all the scanning himself and all the fine-tuning. Which is one of the reasons this book looks so great! The paper we use is chosen for having the rough feel of art paper. Again, I want these books to be the next best thing to owning the original art, and that includes the feel of it too. Mithra: Did you have to reach out to collectors to get any pages? Dunbier: Not on this book. But on others, yes. Mithra: One of the questions I've been sent in emails through the site is why is this being produced through IDW and not Marvel. Obviously you have the experience with these editions and you can't go into the arrangement here, but was it simply Marvel giving you their blessing? Dunbier: Shhhh! Please keep this book under your hat, we're hoping they don't notice! I'm kidding, of course. Luckily the kind folks at Marvel were receptive when we approached them about doing Marvel Artist's Editions. It became easier when we sent them copies of Dave Stevens. The Rocketeer: Artist's Edition. Once they saw it they wanted to do something with us, it was only a matter of working out the details. Mithra: I've noticed in some preview pictures that in addition to the pages, there's also some overlays as well that Mazzucchelli used. What were those used for, as I'm guessing now with technology, it's not something that is used anymore. Dunbier: Before Photoshop, when an artist wanted to use an effect called a "color hold" (which is the process of having line art turned to a color) they would need to draw on a separate sheet of vellum and it would be scanned and printed as a solid color. Most of the color holds David did in Born Again were lost over time but several survived. We took those five and printed them on vellum and inserted them with the corresponding pages. It came out pretty well, I think. Mithra: Speaking of technology, how do you feel about many artists producing all their work on computers now? I don't know what word I'm looking for, but I like being able to see all the lines, all the scratches and the process involved with making a comic page. Dunbier: A computer is a tool like any other, if an artist is comfortable with it and the work is good, it doesn't bother me. That's me talking as an editor. As an art collector, that's another story. Mithra: Considering this is a classic Daredevil story, which you've probably read multiple times... there had to be something you saw during the production of the book that stood out to you as "new". Anything come to mind? Dunbier: I was actually talking to David about this a few weeks ago, I told him I was noticing little things here and there throughout the book that I had never seen before. The size coupled with the lack of color gives the work clarity. Mithra: How many different designs were mocked up? I recognize the regular cover from an issue of MARVEL AGE, and the variant cover is from the poster by Mazzucchelli, but were others considered? Who designed the book and the slipcase? Dunbier: These were the only two covers mocked up. Randy, my designer, picked them and I agreed with his choices. The main cover, as you pointed out, was originally a MARVEL AGE cover. The variant was the cover of the Born Again Collection, and the slipcase is an extreme detail of the painted cover -- very striking. Randy also came up with the ingenious idea of having braille on the bottom right of the main cover. Speaking of the Design, David was very supportive throughout the process and approved everything at every stage. Mithra: And last question, speaking of the variant, can you give some details about that limited edition? This can only be pre-ordered through the IDW site and only picked up at Comic-Con? Dunbier: That's right. It has a bound in signature plate that has been signed and numbered by Mazzucchelli and is only available for pre-order and pick up at the SDCC. If there are any left over after the show we will make them available on our website.